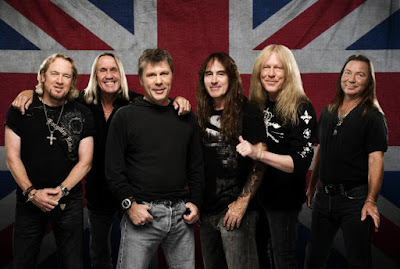 Iron Maiden kicked off the North American leg of their 2017 Book Of Souls tour in Bristow, VA on June 3, and video from opening night has surfaced online. The band delivered the same 15-song setlist at the city’s Jiffy Lube Live as they performed on the recent UK and European leg, starting with 2015’s “If Eternity Should Fail” and featuring several classic tracks from throughout their career. Swedish rockers Ghost are on board for the 7-week North American run, which will wrap up at New York City’s Barclays Arena on July 21. In sync with the tour, Iron Maiden are releasing the final round of vinyl reissues featuring twelve albums from their catalogue on heavyweight 180g black vinyl. On June 23, the band will deliver “Brave New World” (2000), “Rock In Rio” (Live 2002), 2003’s “Dance Of Death" and 2006’s “A Matter Of Life And Death”, with the 2017 editions set to wrap up on the leg’s July 21 closing night with 2005’s “Death On The Road” (Live), 2009’s “Flight 666” (Live), “The Final Frontier” (2010) and 2012’s “En Vivo!” (Live).